Valentine’s Day is just around the corner, and I must say I’m biting my fingernails a bit at what to get The Mr. In the past I’ve made him love vouchers, you know those cards that say you can redeem this for two hours of complaint-free remote control ownership and the like? Except he always hoards the vouchers, “for a rainy day” he says, so he never get’s around to really using them, which doesn’t feel like much of a gift. So what do you get the man who doesn’t really want anything?? Food. That’s what! You know what they say about the way to a man’s heart, after all. A romantic homecooked dinner it will be, then! First, pull out your handy dandy Silhouette and cut out your design. I used a small stretch of vinyl to make an etching stencil. 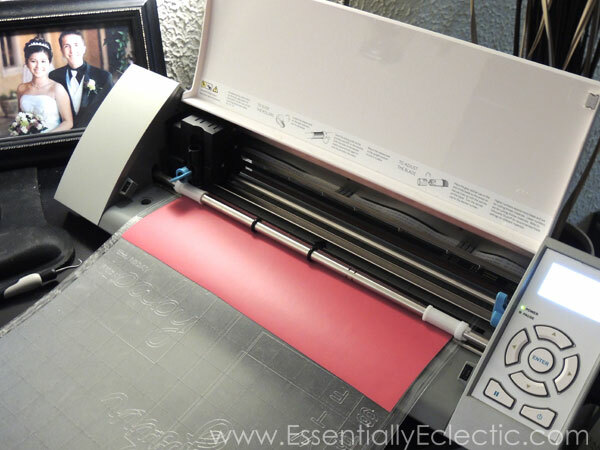 If you use Silhouette’s Vinyl Starter Kit, it comes with stencil vinyl, but regular vinyl works too. Then use transfer paper to lift the design off the white vinyl backing. Transfer paper helps keep intricate parts of the design (such as the teardrop-looking loops inside the E and O) in place. 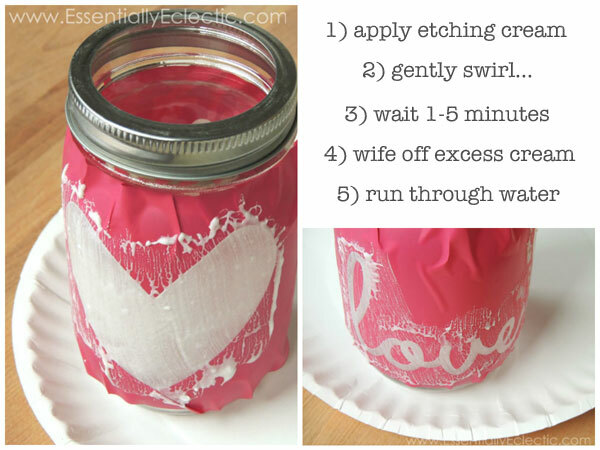 Next, place the design on your mason jar. 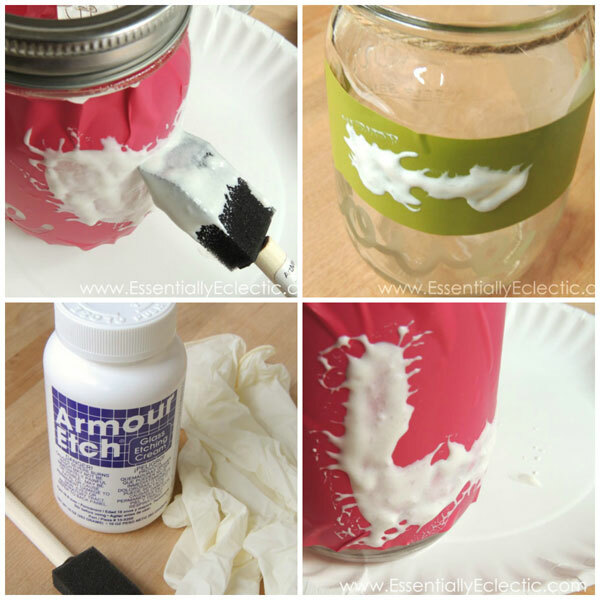 I preferred to use Kerr mason jars for this project since they have more of a smooth surface to place your vinyl. 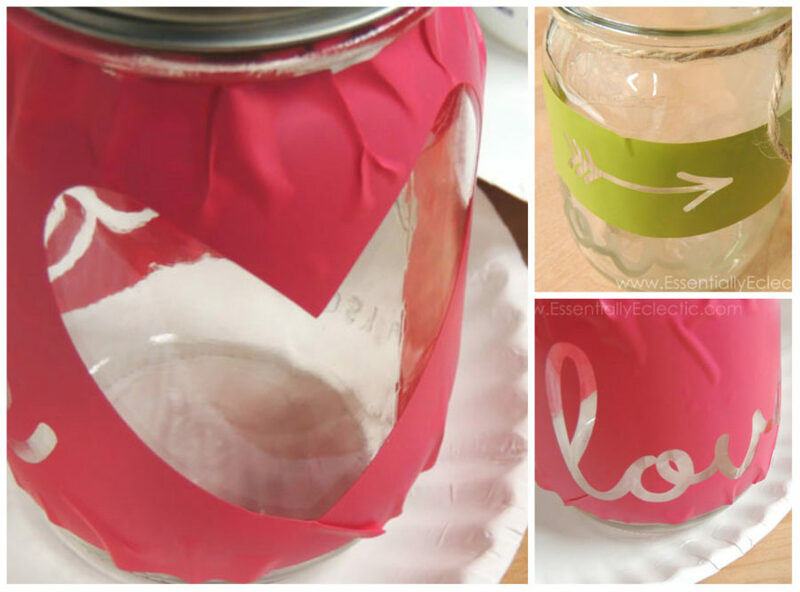 Now, I had originally designed the jars to just have the word love with a heart next to it. However, once I had finished my first jar I felt like there was some empty space above the word love that needed filling, so I quickly cut the arrow stencil (green stencil below) and applied it where I wanted. When you’re applying your vinyl, it’s not imperative that it lay perfectly flat. In fact, I made sure to cut my stencil a bit large so that I had room to splatter my etching cream if need be. As a result, my applied stencil looked pretty sloppy: it folded over on itself in several places and there were a few air bubbles here and there. However, I made sure that there were no air bubbles along the edges of the letters or any critical lines in my design (e.g. the heart) since I didn’t want etching cream to seeping in and etching outside the stencil. Once your stencil is in place and air bubbles are under control, pull out your etching cream, foam brush, rubber gloves and protective eyewear. Etching cream can be very dangerous: it should used in a well ventilated area (I had a large window fully open despite the 16 degree weather today! ), and it should not come into contact with your eyes or skin as it can cause serious burns. I had some doctor-style rubber gloves on hand, and I used two pairs since just one seemed a bit thin. Using your foam brush, apply a thick layer of etching cream to your design. I’ve read that it is a good idea to periodically swirl your cream around gently at least once while you wait. This helps you get a consistent frosty look across your design (as opposed to having some etched areas appear too light). Armour Etch recommends leaving the cream on for about a minute, but I left the cream on for longer to ensure my etching wasn’t too faint. According to other bloggers who have used this brand of etching cream, 5 minutes is all you need: 1 minute may give faint results and 10 minutes will give you a design that doesn’t look much different from what you’d get with 5. Once 5 minutes had passed, I used my sponge brush to swipe off the excess cream and put it back in my jar to reuse later. From there, I rinsed my mason jar off in the sink (still wearing gloves) and dried it with a paper towel before removing my stencil and admiring my newly decorated mason jar! I loved the way these turned out! I tied a twine bow around the top rim and BOOM: I had the perfect Valentine’s day gift container. Simple, but so cute! 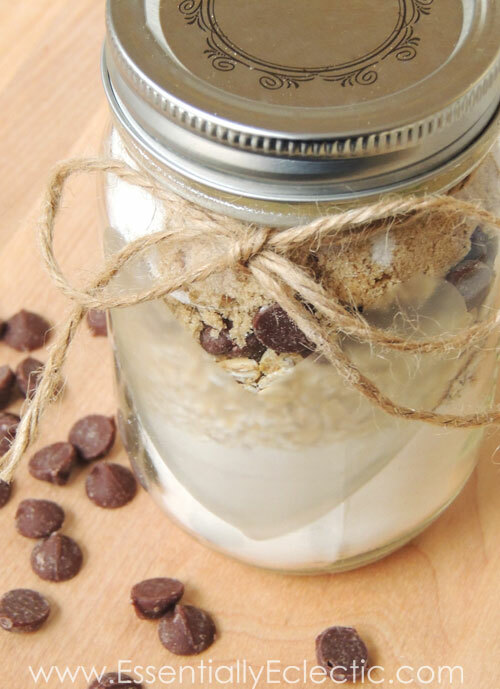 I used one of my jars for a cookie mix gift (perfect for the measuring-spoon-averse gentlemen in your life!) while the other is going to be a votive candle holder centerpiece for my homemade Valentine’s Day dinner with The Mr! There are, of course, loads of other things you could fill these jars with: Hershey’s Kisses, Reese’s Peanut Butter Cups, pink and red M&Ms, chocolate covered popcorn, love notes for your S.O., date night ideas on popsicle sticks or sticky notes–you name it! Aaaand just in case you want to make one of these jars yourself, I have included a FREE Silhouette Studio cut file for you! P.S. DISCLOSURE: This post contains affiliate links, meaning I will receive a small commission on products purchased through these links at no extra cost to you. Please see my FAQs and disclosure policy for more information. Gabby, This is such a great craft. I’ve pinned it for someday when I get a Silhouette! 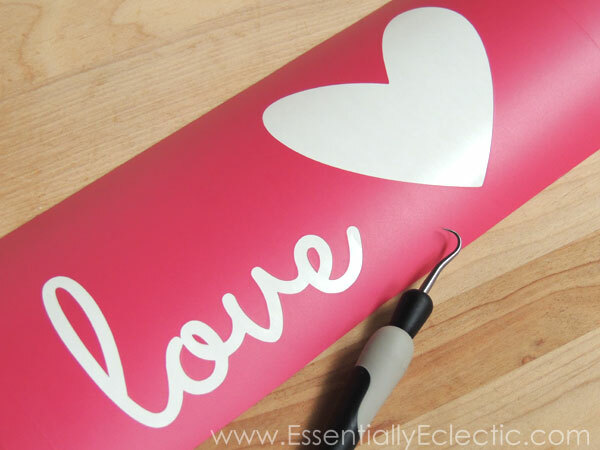 But in the meantime, could I make my own stencil using contact paper? As a nurse, I like and endorse all of your safety measures (gloves, open window, etc.) and loved all of your ideas for filling or displaying the jars! Happy Valentine’s Day to you and The Mr.! What a delight to pop over here and see your comment, Mama! Essentially Eclectic just draws good people, I suppose! I really love this! It can go way beyond Valentine’s day too. Pinned instantly. Nice job! I love the combination of the images, it works well together! So very cute!!! I love how ‘etched’ yours turned out! Mine sometimes just don’t show up that well. Great job! 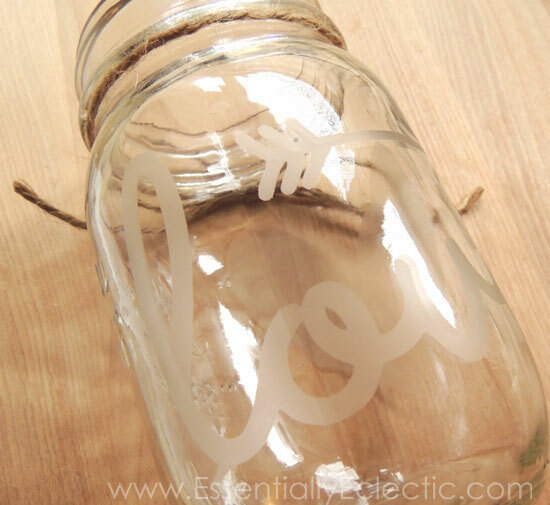 Love the etching on the mason jars. oh gosh this is super cute gabby♥ i really love it! cameo is on my list to buy.. This is so cute, there are so many possibilities for this project! I need to get myself a silhouette, they look like they’d be so great for so many crafty things. I have some etching cream I think. Must try it out! Thank you for linking up to the Weekend re-Treat Link Party! Thanks so much for sharing this adorable project at the par-ray this past week. I love how they turned out. HUGS!! Thanks Kelly!! :) I will be back! Thanks Kristy :) I was thinking about all the things I want to etch now that I finally have a Silhouette. Must. Etch. Everything!!! 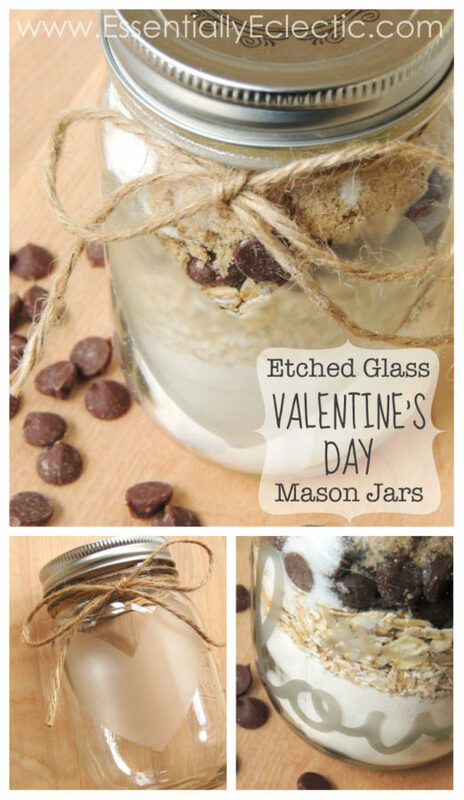 Mason jars are just the beginning! I just want to let you know that your etched glass valentines day gift mason jars is on my top 3 from last week’s The DIY’ers! Congratulations! This will be featured onto my pinterest The DIY’ers Party Favorites board. Thanks Rea! *flattered* Started following along on twitter, G+ and bloglovin! :) Have a great weekend! This is so clever and so cute…I love this idea. 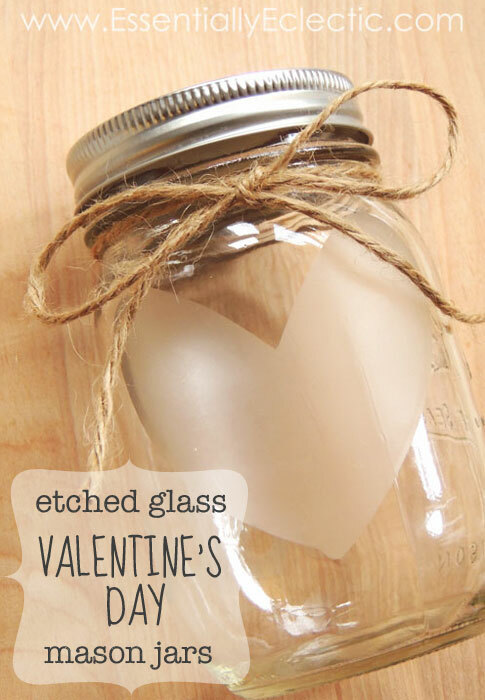 What a great way to say Happy Valentine’s Day…you can fill it with anything! Thanks for the tutorial! You are so welcome Jodee! :) Thanks for stopping by! Pinning, of course! And thanks for the amazing inspiration! Love, love, LOVE your Mason jars!!! I’m new to the Silhouette world and I haven’t tried using the etch cream yet. For some reason it seemed intimidating to me. But your step-by-step tutorial is giving me the confidence to try!!! 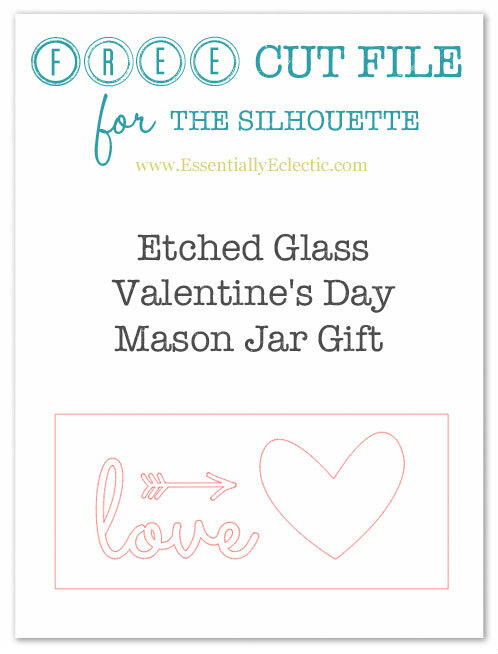 I’m really honored that my “LOVE Banner” was included in the Silhouette “Valentine’s Day Round-Up” along with your great Mason jars!